I am asked a lot of questions every week either via e-mail or in the comments sections of my blog posts. A lot of the questions are the same. In order to get answers to you, the reader, faster I thought it would be helpful to have some of these very popular questions and their answers all in one place. If you have a question that is not answered here please feel free to ask either via comment or e-mail. I love to help people, and I love to discuss the nitty gritty of Montessori with someone who is actually interested! I have been asked many of these same questions for more than four years now. Of course my answers have changed and will continue to change over time. I will try to address some of the age differences when I can. However, keep in mind on the day I am writing this I have a 5.5 year-old in his last year of Montessori primary and a newly-seven-year-old in his first year of Montessori elementary. I don't actually get a lot of questions specifically about "Montessori." The questions I'm asked usually are more about the ins and outs of being your own child's teacher. A lot of the questions I am asked really amount to "parenting" questions more than even "homeschooling" questions. Because it is what I tend to do, I will tell you what I think. I am not an expert on parenting. My experience as a parent amounts to just the two imperfect little boys you see every day on the blog. The boys' two sets of grandparents don't seem to agree on whether we are doing a great job or ruining them forever. Since the jury is still out on that, you have to take or leave my advice and do what you think is best for your own kids. If my tone in any answer gives the impression that I think I'm an expert I apologize in advance. Like any parent, there are a few things I do well and that's what I'm writing about here. My family would tell you if they could all about the crazy things I don't have a handle on. Q0: How did you decide to homeschool? 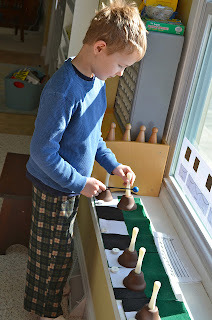 How did you discover Montessori? Why did you choose to use the Montessori method to homeschool? 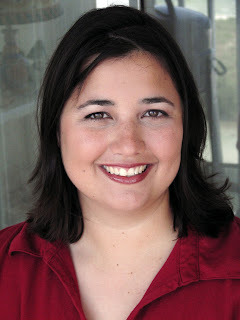 A: In January of 2012 I was interviewed on the blog My Homeschool Style. You can find the answers to these questions there. 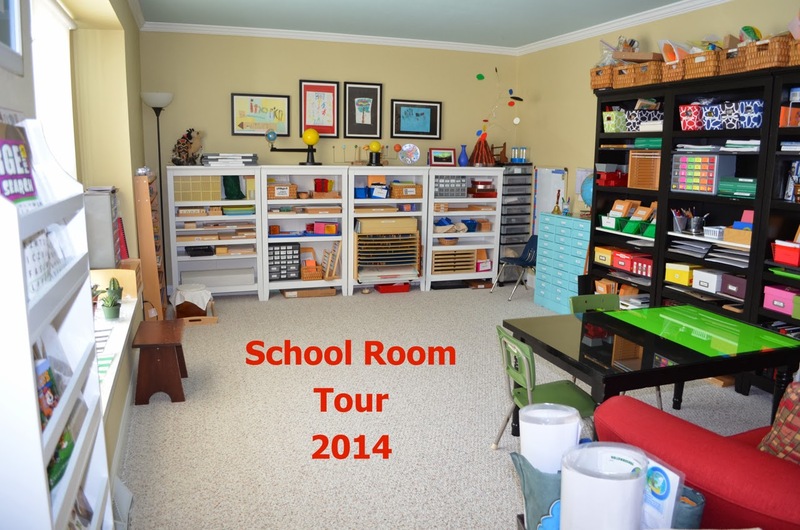 Q1: Do you feel you need to have a separate school room for your Montessori materials? A: You do not have to have a separate school room for your Montessori materials. 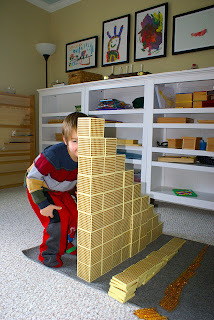 In fact, you don't even have to have Montessori materials to homeschool in a Montessori way. However, I find it easier for me to have the materials. And, being an organized person, since I have the materials I have to have a place to put them. It makes sense to me to have them all in one place. Our Montessori materials have MORE THAN taken up the space in the "school room" (what was designed in 1978 to be the "formal living room" of our home). So, not only do I not want to have other things (toys, etc.,) in that space but I don't have room! Q2: Do you set aside special time to be in the school room? How many days a week do you spend time in the school room? A: Yes, we set aside time to be in the school room. In order for the boys to keep moving forward with their learning I need to keep giving them new presentations. I do a better job giving them what they need if I block out some time to do that in my schedule. When we have a "work session" it usually lasts about three hours. The rhythm of our days usually has us in there from 9 a.m. to noon. Currently with a 5.5 year-old in his last year of Montessori primary and a newly-seven-year-old in his first year of Montessori elementary we aim for 4-5 days in the school room. Last year I was only aiming for 3-4 days in the school room. The year before it was 2-3 days. Yes, Me Too has always gotten one more day of work than Kal-El did at the same age. That is one of the disadvantages perks of being the youngest child. We tend to spend four days in the school room more often than five due to things like the homeschool coop the boys participate in or spending time with family. The boys spend a lot of time in the school room outside of our work periods including evenings and weekends. Just this week the boys spent several hours in there on Sunday afternoon "playing school." They were taking turns being "the guide." Q3: Can the boys go spend time in the school room anytime they wish? Is it locked? A: Yes, the boys now have full access to the school room at anytime that I'm not specifically asking them to do something else (eat, bathe, go to the dentist)! When they were younger than four I used to lock the door (our old school room had a door, one could alternatively use a baby gate) to protect the materials and the children. There are choking hazards in there! Q4: How do you begin a work session? A: Start one? How do I stop one! The boys usually beat me to it. Often when they wake me up in the morning a lot of work has already happened! They know the routine and usually wander in there right after breakfast and get to work on their own. I keep an antique school bell in the room on the shelf (it was great for walking the line when they were younger). It is a beautiful way to get things started when they haven't begun on their own. Kal-El has turned the concept of a "school bell" on its head and loves to use the bell to call ME to the school room at random times to show him something. Q5: My child can't seem to stop working on "fill-in-the-blank" and I want him to be working on "fill-in-the-blank." He's not repeating the works I think he should be repeating. What should I do? A: I believe your Montessori space should be a space where the child can choose his own work, particularly at the primary level. However, it is called "the prepared environment" for a reason! There shouldn't be work in the environment that you are not happy with him doing. Stock the room so that you are happy with ANY of the child's choices. If you don't want them doing "fill-in-the-blank", what is it doing in there? If there is work you believe your child should be doing the first thing you need to remember is that you might be wrong. 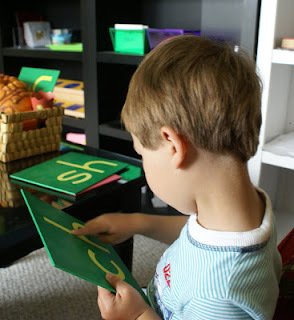 When you are just starting to have Montessori work periods at home finding the right spot in all of the sequences for your child is by FAR the hardest part. The work you think he should be doing might be either too easy or too hard (the most common reasons for disinterest or not repeating work). Another problem can be that some sensorial materials just don't have the appeal in modern times that they did when Maria Montessori created them. 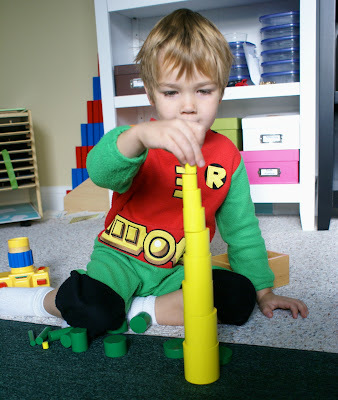 It is not a big surprise that my children who had a beautiful set of unit blocks among their playthings nearly from birth were not as excited about the pink tower as Maria Montessori's students many of whom had nothing. If there is something you feel they should be doing all you can do is keep presenting the work. It will either catch on or it won't. Also, if there is something I want them to do and they don't seem to be choosing it I think about what I can do to make it more attractive. Kal-El and Me Too both put their completed equations in a treasure chest for their memorization work. Me Too pretends its a robot that eats equations. Usually putting the image of a dog on just about anything makes Me Too think it is the coolest thing in the world. 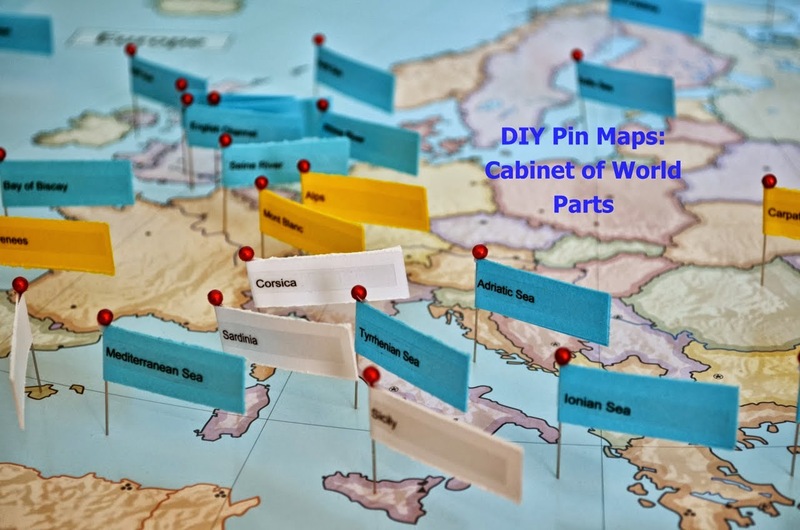 Montessori makes it very easy to "theme" a work to tie in with your child's interests so take advantage! 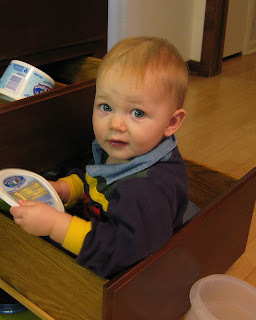 Q6: My child won't let me give him a presentation or keeps taking the materials and trying to show ME. What should I do? A: This is definitely one of those things, along with mistreating the materials, that is more of a "behavior" problem than a "Montessori" problem. If you take a good hard look at your child's interactions with you and with toys during the rest of your time together I bet you'll find some similarities. When your child goes to school outside the home it is possible for them to learn two sets of rules...one for with you at home and one for at school with his teacher. However, if the child is homeschooled the parent and the teacher are the same person. Parents are often willing to put up with certain bad habits in the way the child interacts with people or toys around the house that they are not happy with during a time set aside for learning. It isn't surprising that the child doesn't understand that there are different rules in "this room" with "this toy" than in "that room" with "that toy." He doesn't understand why he can grab the dump truck roughly from your hand and drive it around even though you were "showing him something" but he can't do the same with the red rods. I would argue that the best time to change the way he interacts with you or handles objects is NOT when you are using your expensive Montessori materials and the atmosphere is loaded with the tension of what he "should" be learning and your anxiety about "whether this is going to work." The easiest and best time to change things is outside the school room. While in a Montessori environment we try to "invite" the child to a presentation with the knowledge that they have right to refuse, the reality as a parent in the home outside of the "school room" there are certain "presentations" they don't have the right to refuse. They boys were required to learn not to run in the road. They were required to learn what they can and cannot touch in the kitchen. I have an expectation outside the school room that when I want to show the boys something or how to use something properly they are expected to listen with good manners. They are expected to handle the objects in our home, including their toys, with care and respect. This probably makes it a lot easier for me inside the school room. Q7: I followed your advice above and my child is STILL refusing the work/presentations I am requiring. What do I do? A: I don't make a big deal out of it. Eventually at some point later in the day there IS going to be something he wants from you. With my boys, it is likely to be that they want to watch an episode of "Power Rangers" on Netflix. It is ridiculously easy to say very matter-of-factly something like "We can't do that right now because we didn't practice violin today." The first time this happened they ran and got those violins out right away. At some point it occurred to them to fuss but the fussing didn't change the outcome and they soon gave that up. I think it's better to suffer through one or two days of fussing than have a battle every day in the school room. Because things have always been like this the boys tend to (but not always) get things done early in the day so there are no impediments to what they want to do later. Q8: My child won't stay in the school room during the time set aside for our work period or doesn't want to do anything when they are in there. How do you encourage continued work if they are not interested? What should I do? A: My kids never abandon the school room during a work period and they always seem to want to keep working. So, I can't address the problem with a solution from personal experience. However, I can hypothesize about why that is. I think it is because the school room is easily the most interesting room in our house. The reason for that is a combination of no video games, very little T.V., and the toy library. You can read more about our toy library here. I think it helps a lot that there is no playroom or bedroom stocked like a toy store to wander off to. The school room on the other hand is chock full of interesting things. At my boys' ages they are also required to do a few specific things each day in addition to the work they choose. So, if they were to wander off they would find that it just interferes with something else they want to do later (see question 7). 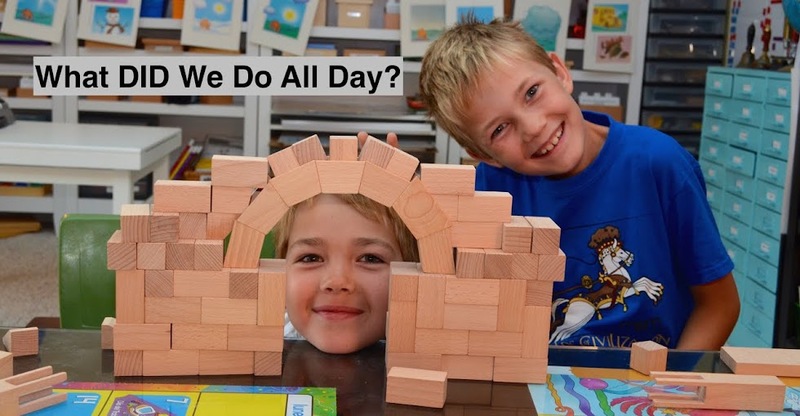 If you read the question about our daily schedule (question 13) you'll see that they have all afternoon and evening to play with toys by themselves. Having Mom 100% at their disposal with all of the school things around them is rarer. Q9: My child won't do ANY work when in the school room, what should I do. A: The good news is, you have a stubborn kid. My Mom always says that we have enough weak people in this world as it is. Perhaps in the future you will consider it to be an asset. Right now I'm sure it's driving you nuts. The first step is to make sure that the school room is stocked with only work that you are happy with your child doing (see question 5). The second step is to cater to your child's interests and make that work as attractive as possible (also question 5). In this instance you probably want to take step two very seriously! The third step is to make the rest of your house as unattractive as possible (see question 8). The fourth step is to be patient and try not to argue with them about it. A child in a room full of interesting things in a house with no place better to retreat to is only going to sit and do nothing for so long. Given the choice of sitting on the floor doing nothing for hours or choosing something off the shelf (especially if you have worked hard on step two), they should eventually find something to do. Once they are in a habit of actually working in the school room you can shift your emphasis gradually from step two more toward step one. Sadly there are some kids in this world that just don't like anything and can never find anything to do. I suspect that in nearly every case they watch too much t.v. and play a lot of video games. Research shows that t.v. and video games, particularly for boys, makes it more difficult to find other activities enjoyable. My boys know this fact by heart. If our family is trying to do something fun together and they boys act "lame" (for lack of a better word) I tell them that the fact that they are failing to see the the fun in what they are doing is telling me that they have been watching too much t.v. and that we will be not watching any t.v. for a given length of time until they are back to normal. Q10: How do you get your boys to do their work independently? I have pretty much never interrupted them or tried to play with them while they were playing nicely by themselves. It is surprising how many parents unwittingly do that. Or the child is happily exploring a toy and the parent interrupts to show them "other things" the toy can do or for some reason waves ANOTHER toy in front of them. Montessori homes encourage independent exploration and setting up almost everything so that even a very young child can do things themselves. Independence is contagious. When they used to relying on themselves to use the sink or choose their clothes they start to rely on themselves for all kinds of other things. I also suspect it has something to do with how little T.V. they watch, that they never watch T.V. with commercials, and that I don't let them play video games (my husband does, but it's a pretty rare occurence). I think our toy library system has encouraged them to play longer with things instead of switching quickly from one to another. You can read more about the toy library and the effect on the quality of play in this post. The choice of toys. We don't buy toys that "do things". We have always bought toys that require the boys to "do things" and that they can "do many things" with. We have never used the word "boring" in front of the boys. Probably for about five years they had never heard the word. Now that they have heard enough friends and cousins use the word they know what it means. However, the word is not allowed in our house. I think they think it's a naughty word. Not only is it more difficult to BE something that you don't have a word for but we are not constantly suggesting that they ARE bored like some parents do. I have a fear of exersaucers. I call them "ADHD in the making." I have no scientific research whatever to back up that claim, LOL! Q11: Do you require your boys to do certain work? A: Yes. But, this is more an element of elementary Montessori (read "work plan") rather than a primary one. That said, I started the requirement a little early. I didn't require Kal-El to any "particular" work until he reached his fifth birthday. Then, I required ONE THING each day. Everything else was their own choice. Approximately every six months I add ONE MORE requirement to their work plan. Q12: What kind of work do you require? So just after his seventh birthday during his work time Kal-El is required to choose three math works, one word study, and practice his violin (this happens outside the work period). Nearly everything else is his own choice. Three math works might sound like a lot, but the math component of at his stage is still split into five-seven "threads" that we need to keep up with (Linear counting/bead chains, operations, memorization, fractions, geometry are the main five. We are adding story problems and equation formats/complex equations into the mix right now.). There are also other elements of his elementary "work plan." Right now this basically amounts to a loose verbal agreement that he will work on handwriting specifically once a week, spelling once a week, and geography once a week. As you can see, Me Too started a year earlier. This was really just because he started violin lessons at that time and playing an instrument is a physical skill that requires daily practice (like exercise). At age 4.5 he asked to have "reading time" every day just like his big brother. 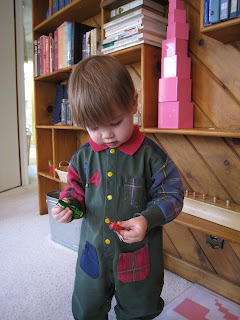 So, the first "Montessori" requirement I made was at age five just like his brother. Q13: I wondered if you would be able to share a typical "school day" schedule at your house? Do you require certain things (chores, dressed, eat breakfast) before they can come to school? A: Kal-El wakes up around 5:30 or 6. My husband wakes up at 6:15. Me Too wakes up around 6:30 or 7. My husband leaves for work around 7:15 and the boys wake me up as soon after he walks out the door (They either come get me or start fighting. Both are effective.) Kal-El plays quietly anywhere in the house he wishes in the morning until someone else is awake. Once his brother is up they play together. They enjoy a chat with my husband in the morning. He might give them a handful of cereal if that's what he's having. The fridge is always stocked with clementines and the boys can help themselves if they are hungry. Breakfast is not served until 8:00. It is also not served unless their beds are made. I do not require getting dressed. Pajamas are fine all day unless we are leaving the house. Me Too tends to get dressed and make his bed immediately upon waking. Kal-El almost never gets dressed unless required and has to be reminded to make his bed every morning. When I wake up I clean my room, the bathrooms, throw in a load of laundry, and then cook breakfast. I check my e-mail, the weather, and maybe read a few blogs in the morning while they eat some of their breakfast. Meals are a long-lasting olympic event for the boys and I don't have the patience to sit with them the WHOLE TIME. I join them a little later on. Lately we have been reading the Bible/devotions during the end of breakfast. After breakfast we do the craft or activity portion of the devotion. We also talk about the calendar. A friend of mine with two boys gave me a great idea this summer. She settles all arguments between the boys according to the date. If it is an "odd" day her oldest child's "day" if it is an "even" day it is her youngest child's "day." If it is your "day" you have to "go first" that day whenever there is a dispute about who should "go first" and you get to "choose first" whenever there is a dispute about who gets to "choose" something. This solved SO MANY problems in our house. We use a toy library system and sometimes they fight about wanting the same toy but don't want to share. Whose day is it? They fight about choosing a television show. Whose day is it? No one wants to be first to get their haircut or get in the bathtub. Whose day is it? This means it is very important to the boys what the date is. Since we have been learning about calendars lately looking at the calendar has become part of our breakfast routine as well. After breakfast I clean up the kitchen. Often times the boys will find their own way into the school room at this point. In fact, I often get called out of the kitchen because they want me to show them something and then the kitchen NEVER gets cleaned up. All of a sudden we are in the middle of a work session and the kitchen stays as it is. Other times the boys start playing again. I generally start school at 9 a.m. if it hasn't already begun on its own. If it is 9 a.m. and the boys are playing super nicely together I might just wait ten minutes until they inevitably start fighting. Then I can say (when they just as inevitably come to me to tattle) "nevermind, it's time for school anyway." If they are playing nicely on their own I might ring the school bell to get things started. As I mentioned in a different question, I keep an antique school bell in the room on the shelf (it was great for walking the line when they were younger). It is a beautiful way to get things started when they haven't begun on their own. Kal-El has turned the concept of a "school bell" on its head and loves to use the bell to call ME to the school room at random times to show him something. Occasionally the boys will tire of school on their own after about three hours. Most days they would keep going forever. Four hour work sessions are common here. I take the temperature of the room starting around noon. When I think it is about time I slip out and start making lunch. Lunch begins anytime between noon and 1:00. After lunch I need some time for my own personal sanity and the boys need some time APART for their own sanity. They choose something from the toy library and play in their own rooms for an hour-and-a-half. This is the time of day I generally put away the load of laundry I did, blog, read blogs, shop online, or Keep up with the Kardashians. Usually around 3:30 the boys are ready for a snack (we are still working on Halloween candy) and then they practice the violin. Afterwards they might play, wander into the school room, beg me to do chemistry experiments, or watch a TV show. We eat dinner around 5:30. After supper is more of the same. We start getting the boys ready for sometime between 6:45 and 7:15. They usually go to bed between 7:00 and 7:30. My husband usually puts them to bed. I might be on the computer or cleaning the kitchen during that time. I usually make some kind of material for school EVERY NIGHT. Often times I do it while sitting on the couch with my husband while we watch a movie. Other nights, I might make things for an hour and we both read all night. Sometimes he really wants to watch some hideous man-show so we go our separate ways and do our own thing. I am also known to hit the bookstore to do some reading or go out with my sister. I am also always tearing our house apart and remodeling things. As for chores, the boys are responsible for getting themselves ready to go places, getting themselves ready for bed, making their beds, clearing the table so we have room to eat meals, clearing their own plates after meals, and storing their own stuff where it belongs. I don't assign other things because we have a standing "help when asked" policy as a membership requirement in the family. They help with lots of things whenever we need them to. Two things obviously missing from this daily schedule are me exercising and doing housework. It should therefore no surprise that my house is not as clean as it should be and I am not as thin as I should be. It's obvious to me that the answer is to get up at 6:15 when my husband gets up and exercise before he leaves for work...easy to say, hard to do. Q14: Do you do your own housework? A: Sadly, Yes. There was ONE YEAR when the boys were maybe 1 and 2 years old when I had a barter set up with someone. I taught her daughter music lessons and she cleaned my house. But that was just for one year. The end result is that my house is not as clean as it should be. I am a Flybaby. If you are familiar with Flylady you know that there is the bare minimum of doing a "one hour weekly home blessing" and cleaning up your hot spots daily but ideally you are also rotating deeper cleaning of rooms in your house all year long. I have been in survival bare-minimum mode for years. About once a month my parents take charge of the boys for a whole day and I catch up on things. Q15: When do you make all of your materials? A: As stated above, I usually make some kind of material for school EVERY NIGHT. Often times I do it while sitting on the couch with my husband while we watch a movie. Other nights, I might make things for an hour and we both read all night. Sometimes he really wants to watch some hideous man-show so we go our separate ways and do our own thing. I have an inner standard for what things should cost and if it isn't "too expensive" I buy as much of the materials as I can. I have enough to do as it is. I also can make things during the boys' work sessions depending on how the day is going. At the very least I use "school time" to do a lot of the research and reading that I need to do to keep up with them. I usually only spend about an hour a day making things, but sometimes I just want to push through an album or a project and will spend three hours a night for a several nights in a row like I did when I made all the fraction materials in one week. Q16: My kid is so social, I don't know how you make Montessori work with just two kids. For those very real children out there who are very social, my personal opinion is that you have a decision to make that I didn't have to. If I had a very social child I think I would have to consider whether it might be worth giving up the benefits of homeschooling to send them to a traditional Montessori school. I would never consider giving up homeschooling to send them to a regular school (which will not be able to meet your child's social needs either) but I would consider it under those circumstances for a Montessori school. As for the positive peer influence that you would have at a Montessori school? It is obviously missing at home. The positives we gain from homeschooling are more than worth that one sacrifice. What helps us a lot is for Kal-El to know from me telling him and showing him that there is more out there. Both boys love the idea of "getting to the next level." So, for example, when I gave Kal-El the first set music notation cards he asked "how many levels are there?" I don't want to cap his knowledge so I never give an "ultimate" number, but I'll say "I've already made you five levels!" This gets him excited about finishing a set and being read for the "next level." When he gets to the end he might ask "are there more levels?" Because in life there ALWAYS is more to know, I always say "yes, but there are other things you need to know first." He invariably says "what?" With Montessori the trail has been so well blazed that you always know what types of things remain ahead. I am always telling or showing. For example early this week I said to Kal-El, "Once you master division with the stamp game I can show you a new thing! It's called the dot game!" I've heard him repeat to at least three different people since them "I'm almost done with division on the stamp game and when I can do it I get to learn something new!" It helps that Kal-El knows that there are other kids out there who homeschool the Montessori way. I sometimes will show him blog pictures of other kids working. He sometimes asks what Bunny or DJ are working on. We are also involved with a homeschool coop. Everyone homeschools their own way, but Kal-El is super excited to learn cursive because one of the older boys in his multi-age homeschool class (his is 1st-3rd grade) told him about it during snack time. The peer influence will never match what he would get in a Montessori school, but it is far superior than the peer influence he would get at a traditional school where it is not cool to like learning, period. Q17: What albums did you use for Montessori Primary? Because I'm a super-famous Montessori blogger I have access to a lot more albums than the average person. For that reason I tend to "album-hop" a lot. It is probably more sane to just pick a set of albums and stick with it. My main set of "go-to" albums were the albums offered free through the Yahoo! Group Montessori by Hand. You will occasionally see them referred to as "Meg's albums." Meg originally blogged at Montessori by Hand and currently at Sew Liberated. Her albums are AMI and follow the AMI tradition of being organized into four subjects. The subjects are Sensorial, Math, Language, and Practical Life and the cultural subjects (music, geography, etc.,) are contained within (usually at the back) of the different core albums. I replaced the "reading sequence" of her language album with the Dwyer pamphlet. I used Karen Tyler's Worldwide Montessori albums (now called KHT Montessori) for all of the cultural subjects (Astronomy, Botany, Geography, Zoology, History, Physical Science, and Ecology...but I never did the Ecology album.). And, of course, I used the Montessori sequence divided by periods pages from David Gettman's book "Basic Montessori" to coordinate our work across subjects. 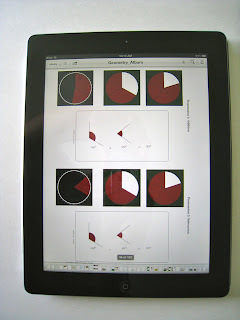 I almost hate to mention it but I also supplemented with two Montessori R&D albums, Grammar and Math. There are just a couple of math items that AMS covers explicitly (equation formats, parenthesis, story problems) that weren't in the AMI album. Karen's albums had those things (hers are AMS also) but hers stopped a little short in some of the operations. 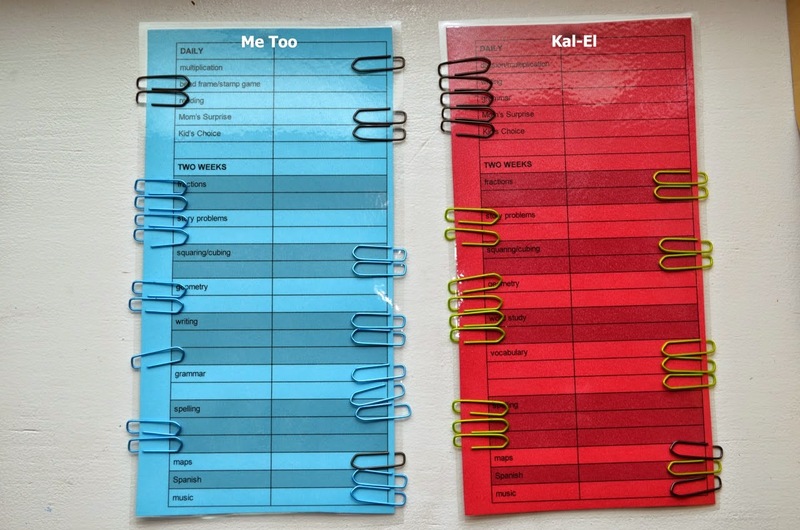 I used the R&D grammar because I inherited a full set of grammar boxes that a friend made using the R&D albums and I needed the album for it all to make sense. If I had to do it all over I would NOT go out and buy a full set of R&D albums for primary. I prefer the Montessori by Hand/Dwyer/Karen Tyler combo that I used. 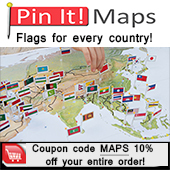 There are some wonderful, new products out there that might appeal to you. One that comes to mind is John Bowman's Montessori at Home. It wasn't available when I started out which is why it isn't what I used. I wound up going so "whole hog" with this Montessori thing that I don't know if it would have been enough for me forever, but I really don't know because I didn't try it. It is probably perfect for most people. I have read it and you can read my review here. I'll stop now because this FAQ was titled "What albums did you use for Montessori Primary" not "What albums could you use for Montessori Primary." Q18: Are you an educator? I usually avoid answering this question because, on average, homeschoolers rank in the 87th percentile for national standardized tests. 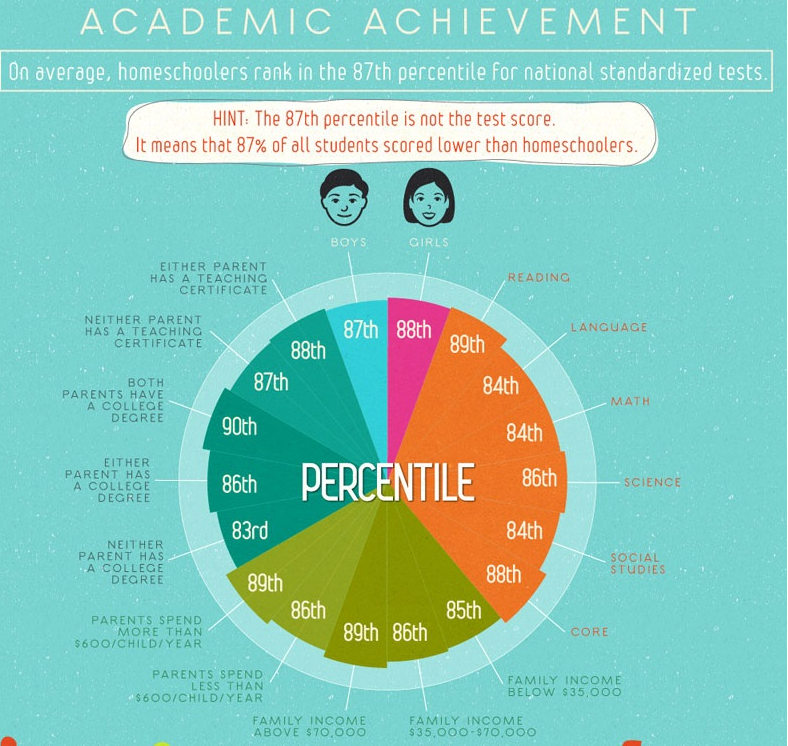 That means 87% of all students scored lower than homeschoolers. Whether the parents are professional teachers or not, have PhD's or not, are low-income or high-income, homeschoolers are scoring significantly higher in academic achievement. There is a great graphic available that give a lot of information on homeschooling available called Homeschooled: How American Homeschoolers Measure Up. Below is just a small section of the graphic that gives the percentile broken down by parent's level of education, income, and whether or not they are an educator. You can click on it to make it larger AND you can see the full chart here. Another reason I avoid answering this question is that I don't really have a "yes" or "no" answer. NO, I do not have a teaching degree. I have a bachelor's and master's degree in flute performance. I have another master's degree and a PhD in music theory. Professionally I am a flautist which means I also have many years experience teaching, but teaching flute. I also taught both flute and music theory at the university level for several years. I happened to teach general music and Spanish (long story, don't ask) in private schools grades K-8 for about five years when I was first married because I moved away from my university and performing jobs. So yes, I've taught, but no, I'm not a certified educator. And no, my experience teaching didn't give me any special skills that qualify me to homeschool. While I'm on that subject, my husband IS a certified educator. He has been a public school teacher for 17 years! While he learned something about teaching during his student teaching time he feels he learned how to teach by teaching. 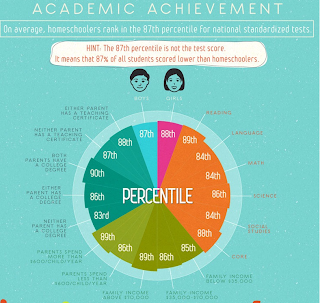 If you look back at the pie chart above, you'll notice that if my children do as well as any average homeschooled child my degrees and my husband's teaching certificate will only make a minuscule difference in their academic achievement. I strongly believe that any parent who cares about their child (and sadly, not all parents do) can homeschool. Not every parent wants to homeschool but it doesn't mean that they can't. I don't think you need to be a former teacher. I don't think you have to have a college degree. I don't think you need to make a lot of money. I think that even single, working parents can homeschool. I do think it would be harder to want to in that situation. Thanks for this! Loved it and I had to read it in one stretch! Enjoyed getting to know your perspective on how to make montessori work in a home school. Thank you for sharing and allowing me to get to know you better. Using the word bored in my house might get you a seven day lecture on "I remember when I was your age and all we had.... and we still..." LOL. Thanks so much for sharing. I'm considering homeschooling my 5 and 8 year old next year. I love the idea of everyone does their own thing for an hour or so each day. It promotes individual play - and it would give me a much-needed break. Love this info! This was so fantastic to read I can't even begin to tell you! I'm sending this to every homeschooling mum I know - Montessori or not! Thanks for being honest and keeping it real, and sharing your lives with us. Wish I could reciprocate, but sadly my other blog has been neglected for months now, so I can't see a homeschooling blog faring a better fate? I enjoyed reading this so much! I have learned more and more about Montessori in the last six months and am still trying to incorporate the methods in to our home (I have five, ages 8 down to 2) and sometimes I feel overwhelmed by trying to find the way to make it work, and it's so nice to be able to look at the things you post. I've found some good ideas and so much encouragement and just enjoy seeing what your boys are doing as I try to keep working towards making Montessori work for us! With the age range I have, and the fact that we are just starting out, I have very little as far as materials for my older two children, and just have what I have been able to DIY for the younger ones :) that being said, my biggest obstacle most days is how to keep my 2 year old busy while still being able to help/teach the older children. Any suggestions? Love seeing how you guys do things and how you responded to so many common questions! I just found your blog site and I think it is wonderful. I have 3 kids who are currently 3, 2, and 1. I would love to do Montessori at home, but I'm not sure where to start. Could you recommend any good books on how to get started? My 2 year old will be 3 in December and she seems to be doing a lot of the same things developmentally that my 3 year old son is doing. Also what would you say are the basic materials to start with? Thanks for your help! That will get you started and direct you to some books. Buying materials is NOT an early step so you can take a deep breath. Once you decide how deep you want to go, the appropriate books will tell you which materials you then want to buy. I love your blog and have found it immensely helpful and enlightening. I feel between Gettman and this blog, I can actually see myself doing Montessori homeschool successfully. And I feel like you have a really good balance of investing in higher quality materials at some points and making frugal alternatives at others. I was wondering if you have a loose yearly budget you aim for and what it was (if that's not too personal?) I feel like the combination of buying and DIYing materials for a Montessori homeschool has got to be *significantly* cheaper than tuition at a Private school, but even the discount materials aren't trivial investments. And, I find my DIY projects are occasionally barely cheaper than their off-the-shelf counterparts, so I'm trying to learn from my mistakes and try to come up with a realistic number for the annual cost of montessori homeschooling. Are the " Montessori by Hand" albums still available somewhere? I've found some alternative places to buy albums but I just feel like I'm sitting on the fence with what I want to do with "which" Albums should I buy or take. I've really thought about KHT but it seems like it's easy to find pros and cons for the various sources out there for albums for homeschooling moms. They should still be available through the Yahoo! group "Montessori by Hand." It has historically taken awhile to get through moderation there. Meg's blog is http://sewliberated.typepad.com/ . One more thing to consider is if you plan to do elementary and if you feel like an AMS or AMI style Montessorian. KHT is AMS. They will transition well to the MRD elementary albums which are expensive and don't have a mentor. 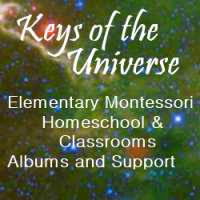 The Keys of the World albums are AMI and transition well to the Keys of the Universe elementary albums which do come with a mentor. They are more economical than MRD. Hello, I never used the Keys of the World albums. Those are primary albums and I’ve used the Keys of the Universe elementary albums. I have seen bits of the KotW albums and they are very similar to Meg’s with the added bonus of Jessica as a mentor, question-answerer, videos and the forums. The album themselves may be similar but the full package Jessica offers can’t be turned down!